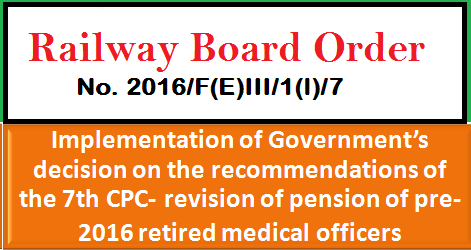 Subject: Implementation of Government’s decision on the recommendations of the 7th CPC- revision of pension of pre-2016 retired medical officers. A copy of Department of Pension and Pensioners’ Welfare (DOP&PW)’S O.M. No. 38/37/2016-P&PW(A)(iii) dated 11‘“ September, 2017 on the above subject is enclosed for information and compliance. These instructions shall apply mutatis mutandis on the Railways also. S.No. | DOP&PW’s instructions | Railway Board’s corresponding instructions. 1. O.M. No. 38/37/08-P&PW(A)(ii) dated 04.08.2016 | Letter No. 2016/F(E)III/1(1)/7 dated 10.08.2016. 2. O.M. No. 38/37/08-P&PW(A) dated 12.05.2017.| Letter No. 2016/F(E)III/1(l)/7 dated 22.05.2017.